Santa Cruz de la Sierra (Agenzia Fides) – “I am most grateful to be here this morning among you to open this American Mission Congress. Let us allow the motto which convokes us ‘America in mission: the Gospel is joy’, resound loudly in our hearts and minds”. 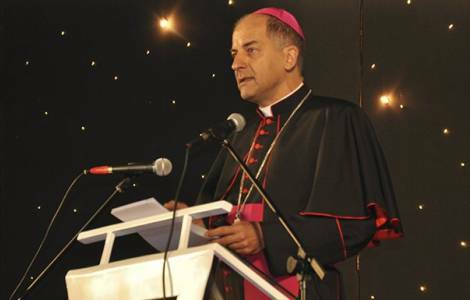 With these words Archbishop Giovanni Pietro Dal Toso, Secretary Adjunct of the Congregation for the Evangelisation of Peoples and President of the Pontifical Mission Societies (PMS), began his intervention during the opening ceremony of the Fifth American Mission Congress (CAM 5). Underlining that the term “Congress” in Latin means "walking together", the Archbishop said: “We have walked here from different places. But we are all called here with our national and cultural differences , for something which unites us profoundly: Faith which is announced and diffused by means of mission. Mission unites us so that we can unite with many other people and all together sing a great hymn to the glory of God. The Pontifical Mission Societies are happy to support this major encounter to revive the missionary zeal of the American continent”. After underlining the service given by the Pontifical Mission Societies and their relations with the Particular Churches the President of the PMS in his address dwelt on three Fundamental themes: “Why mission?”, “The content of mission”, “Prospects for mission”. “The mission of the Church is born of the very life of God– he explained -. The Father Creator who sent his Son, now calls us to be his continuers and collaborators in the salvific mission. Divine missionary dynamic pours forth unceasingly from the inexhaustible charity of the heart of the Father and expresses itself sending the Son and the Holy Spirit and reaches us so that we may put ourselves at his service”. God comes to us through the person of the Son Jesus Christ, who became man to free mankind from the power of darkness and to reconcile us with the Father. “A renewed encounter with the living Jesus Christ, our Saviour, changes and transforms us into coherent witnesses to the Love that saves us. The first attitude I would ask you to assume at the beginning of the Congress – said archbishop Dal Toso – is the one suggested by Pope Francis: let us look to Jesus, the missionary of the Father, ‘with an open heart, let ourselves be contemplated by Him’, coming from every corner of this continent and the world, we lift our hearts to contemplate the face of the crucified Christ, Risen”. The PMS President then recalled the validity of the classical understanding of mission Ad gentes, which indeed assumes greater force “so that in territories like Europe or America, proud of long evangelisation, there are growing numbers of people who do not believe, are indifferent or totally ignorant regarding the faith”. Furthermore the announcement of Jesus Christ has still not reached all peoples, and there exist still vast regions the earth, for example Amazonia, where the implantatio Ecclesiae is still at the first stages. To become Christians therefore is not an action concluded once and for all, but, as the Pope says, it is a path of maturation which accompanies our whole life. “We all need to grow in our knowledge of Christ, and when this growth has stopped it means there is no life. Christian life is a continual deepening of the faith which has its beginning in kerygma. As missionary disciples we are called to shoulder this kerygma personally and make it the centre of our announcement”. After some considerations “regarding the faith as a theological virtue and the faith as the content of the things we believe”, the archbishop continued: “the content of mission is the announcement of Christ who died and is risen, an announcement addressed to all, which gives rise to faith as a virtue and develops as knowledge of the contents of the same faith from which they emanate”.